Life In A House of Blue ! : Bake Me A Wish ! Home > Giveaway > Bake Me A Wish ! Bake Me A Wish ! Do you enjoy cake ? My family does, especially when it is deliv ered right to our door ! Recently we had the chance to review a double fudge crunch 4" singular sensation cake from Bake Me A Wish. It arrived right to our door via UPS at a perfect time for use to enjoy it after dinner on a Friday night. When it arrives it was packaged in a very nice box, the presentation is great and anyone would be happy opening this on a special occasion. Now on to the delicious cake ! 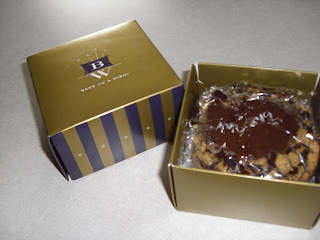 The double fudge crunch 4" singular sensation cake is described on their site as "Good things come in small packages! Our moist & fudgy brownie cake is topped with mouth-watering chocolate chip-cinnamon-oat streusel and ribbons of dark chocolate glaze, in a size just right for the individual." Can you say YUMMY ! I told my family they where lucky I gave each a bite because I would of had no problem eating it ALL by myself. Looking on their site I am amazed by the selection of cake they have available. A few that caught my eye that I would like to try in the future are Vanilla Bean Cake, Peanut Butter Mousse Cake and the Caramel Apple Crumb Cake but honestly my list could go on and on ! 5% of any cake order goes to Bake Me A Wish!’s Operation: Birthday Cake, which, together with their partner Soldiers’ Angels donates birthday cakes each month to soldiers overseas who are having a birthday. As you can imagine it is a great morale booster to a soldier to be remembered on their birthday. When you purchase the Freedom Cake for a recipient here in the US, Bake Me A Wish! will deliver a gourmet cake to a soldier serving overseas, in the name of your recipient. The Freedom Cake features a layer of deluxe chocolate brownie thickly blanketed with smooth & creamy fudge frosting, with an avalanche of sprinkles adorning the top and bittersweet chocolate shavings all along the sides. Each cake features a special card informing the recipient that a cake has been sent to a soldier in their name, alongside an imprint of the American Flag. Soldiers overseas will receive this exact same cake you order here! Remember the excitement you felt as a child when your birthday cake was carried into the room? At Bake Me a Wish!, we believe we all still have some of that child inside of us, and our goal is to help you recreate that excitement and experience for your friends, clients or loved ones.Bake Me a Wish! is the premium nationwide service for delivery of gourmet birthday cakes. Our cakes are made with only the finest, freshest ingredients by an award-winning family run New York bakery that also supplies pastries to some of Manhattan's most elite restaurants. Through careful cost control and air-tight delivery systems, we are also happy to be able to bring you our fine cakes at an extremely affordable price. Now, whether it's your son in college, your trusted associate, your old friend, or your granddaughter across the country, you will always have a simple and wonderful way to remember them on that important day of the year. Plus, with our Bake Me a Wish! Calendar, we can keep a record for you of any and all important birthdays so that you never accidentally forget the special people in your life. We will automatically send you a reminder asking if you would like to deliver a cake each time one of your selected dates is approaching.We believe there is no better way to celebrate that special day of the year than to send a little indulgence from someone who cares. BUY: Visit Bake Me A Wish and order cakes for all your upcoming birthdays and special occacions. Remember 5% of your order will be contributed to Bake Me A Wish!’s Operation: Birthday Cake, which, with our partner Soldiers’ Angels, donates birthday cakes each month to soldiers overseas. Choice of either Cookies and Cream or Double Fudge Crunch 4" Singular Sensation Cake ! At Bake Me a Wish, I want to try the Tiramisu Classico Cake. And I also like the Singular Sensation Double Fudge Crunch. The kids freedom cake would be superb as I have a boy turning 13 this month and he would love to see this cake. I have a hard time picking because they all look so good. I think either the Red Velvet or the Triamisu. The Caramel Apple Crumb Cake catches my eye! The Caramel Apple Crumb Cake looks delicious to me! The coconut cream cake has caught my husband's eye but I am a chocolate fanatic. Who wins, lol? I'd love to try the peanut butter mousse cake. Thanks for the chance. The Freedom Cake looks absolutely divine! I have to say that I always wanted the cookies and cream cake whenever I went on the site. It just sounds amazing. The Caramel Apple Cruumb Cake loks wonderful. The Magic Bar Brownie Cake caught my eye! The Chocolate Mousse Torte Cake looks devine. Thank you for the tasty giveaway. The S'more Brownie Cake looks divine. Thanks so much. Caramel Apple Crumb Cake sounds delicious! The Red Velvet cake would be my choice! Thanks! I love vanilla so the Vanilla Bean Cake would be great. Oh the Red Velvet Chocolate cake looks yummy! I would love to try the Peanut Butter Mousse cake! I am a FANATIC!!! There are so many cakes to choose from but if I have to choose it would be the triple enrobed brownie. The Carrot Cake! It is my favoirte and this one looks delicious. Peanut Butter Mousse Cake, zomg it looks so good! The Magic Bar Brownie Cake looks wonderful!! I must have that coconut cream cake. The Freedom Cake looks delicious and I love that I can do something good for our soldiers overseas!! The Chocolate Mousse Torte cake looks delicious. The Coconut Cream Cake looks nice! They all look absolutely delicious! I think my grandkids would like the S'mores cake. 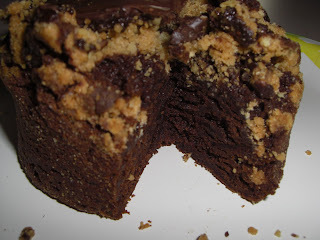 The Triple Chocolate Enrobed Brownie Cake looks wonderful! OOOOOHHHHH, so many to choose from but I guess the Tripple Chocolate Enrobed Brownie Cake caought my eye. But I really like that Cookies and Cream Cake so if I win Iwill be set!! LOL!! the cookies and cream cake would be great for my husband whose birthday is coming up. The Vanilla Bean Cake looks really good. Chocolate Mousse Torte Cake. Thanks. The Caramel Apple Crumb Cake sounds amazing! These photos are making me hungry! The Peanut Butter Mousse Cake looks delicious. I'd like to try the vanilla bean cake. I like the Freedom Cake. The Magic Bar Brownie Cake looks amazing! I think the Chocolate Mousse Torte Cake looks good. I have your link on my blog roll. Yum! I'd choose the Vanilla Bean Cake. The Peanut Butter Mousse cake sounds fantastic. The Freedom Cake looks great. I like the magic bar brownie cake. The Vanilla Bean Cake sounds delicious! Red Velvet Chocolate Cake sounds great. I agree with Alexander - give me Red Velvet Chocolate! Also, love their boxes. The cookies and cream cake looks good! I would use it to celebrate the arrival of our baby girl (due next month)! Would love to taste their Peanut Butter Mousse cake. The Magic Bar Brownie Cake looks delicious!!!! The vanilla bean cake sounds yummy! The Smore Brownie Cake looks great! I think the Magic Bar Brownie Cake looks really delicious. I would love to try that. Thank you! I'd like the Tiramisu Classico Cake. The Red Velvet cake with cream cheese icing definitely catches my eye! Red Velvet is my all-time favorite. The Coconut Cake sounds delicious. Thanks for the chance. The coconut creme cake looks delicious. i want the coconut cream cake! The Chocolate Mousse Torte Cake caught my eye. Wow, the Triple Chocolate Enrobed Brownie looks incredible! The Freedom Cake looks really good and my cousin, who is in the military, would love it! I left a comment at Fairytale Brownies - Special post. The Tiramisu Classico cake looks delicious. I left a comment at IN PRAISE OF STAY-AT-HOME MOMS post. The double fudge crunch looks the best. No such thing as too much chocolate! I would love to try the S'more Brownie Cake! YUMMY! Thanks for the chance! I'd love the Coconut Creme Cake. I'd love to try the 'Boston Cream Cake' sounds like heaven to me!